In the latest eNote, we showed you how to turn ordinary bi-fold doors from the home center into a creative, painted headboard. If the look isn't quite right for your space, but you like the general idea, you're in luck! By painting and arranging the doors differently, you can totally customize the style of your headboard. Check out a few examples we came up with. 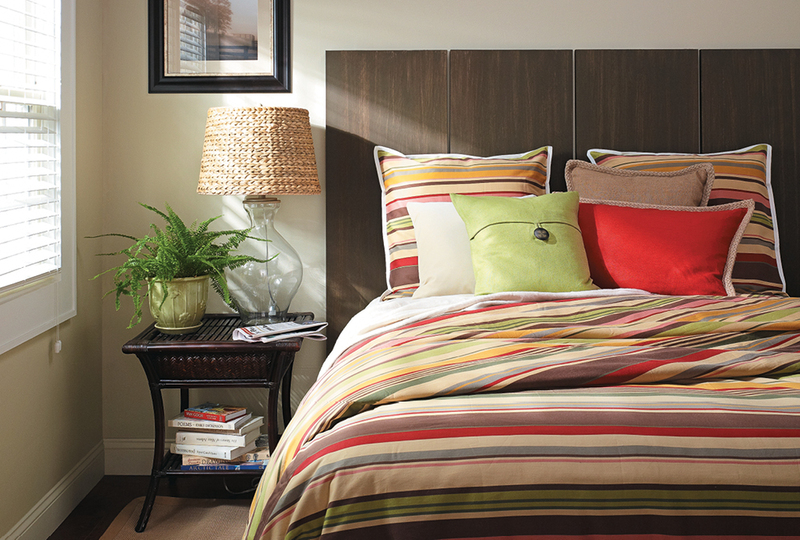 Up first, classic stripes and colors provide a look of timeless sophistication in the bedroom shown above, and a wood-toned headboard made with shorter panels fits right in. To get this look, cut 18"-wide door panels about 55" long (photo 1). Then dip a 3"-wide brush into paint so that only a little remains on the bristles. Brush over each panel with long strokes, creating streaks that slightly reveal the natural wood beneath (photo 2). When the paint is dry, apply a coat of clear polyurethane. Our other featured room boasts a sea-inspired theme, so the headboard has a horizontal design. Mounting long panels on their sides is a great way to change up the look, plus you can cover a wider area of your wall with fewer panels! You don’t have to live near a beach to enjoy a room with nautical flair. Just use classic colors and “whitewash” painted panels, so they look like they’ve been weathered in sun and salt spray. To create this look, apply a country blue base coat, and let it dry thoroughly (photo 1). Then, mix 4 parts clear faux finish glaze with 1 part cream paint, and use a loofah ball to wipe it over the panels (photo 2). Again, allow the paint to dry completely before finishing with a coat of clear polyurethane.